Take your project from concept to reality at Elevations by Shelly's. 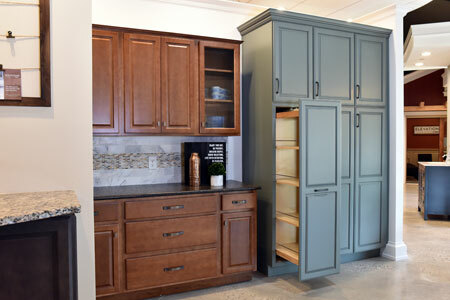 We offer the finest in cabinets, countertops, hardware, doors and windows in our unique and upscale design showroom. From start to finish, our design specialists offers you the versatile support you needed. Take a virtual tour below or schedule an appointment to experience our showroom in person. Our newest location is far from new! Read a brief history of the “Grand Barn” and some of it’s owners dating back to 1704. The property on which the Barn sits was in the original patent for land in what became West Whiteland granted by William Penn to the Welsh Quaker, Richard Thomas of Whitford Garne, Flintshire, Wales in 1683. Shortly after arriving in Philadelphia with his young son, Richard Thomas I, he died and his son was cared for by friends and relatives until the boy reached adulthood. By that time, 1704, most of the desirable land had been settled by other Quakers in the area. In 1704 Richard Thomas I received a patent for 1869 acres in this area. In 1711, on the property of the current barn and house, the young Richard Thomas I settled and built a home. In 1712 he married Grace Atherton from Liverpool England. The property continued to be owned by descendents of the Richard Thomas family for 200 years. In 1845 a great grandson of Richard Thomas I, Richard Ashbridge, built a gambrel roofed house supposedly very similar to the original building and on the same or adjacent site. At some point during the Ashbridge ownership the stone barn was built. It is indeed a grand barn. In 1913 the farm was bought by Richard M. Newlin and passed from Thomas ownership. Mr. Newlin modernized and expanded the Thomas house and added the frame and stone garage and stone tenant house (now Maggie Moo – serving ice cream). The property was operated as a fully functional farm by the family. In 1957 the property was sold again to the Harold Martin family. 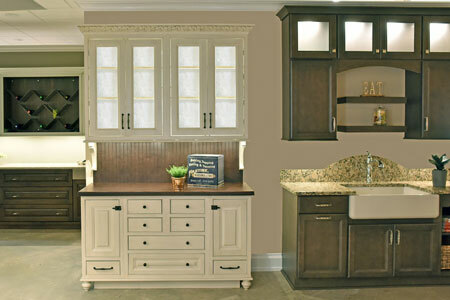 With over 5,000 square feet, Elevations by Shelly’s is the Philadelphia area’s premier showroom. Our full-service design center features product options for the minimalist to the eclectic. Discover custom cabinetry, beautiful tile and stone countertops, backsplashes, handcrafted hardware, and more. Explore Elevations by taking a virtual tour of our showroom.